The Rosamund of J.W. 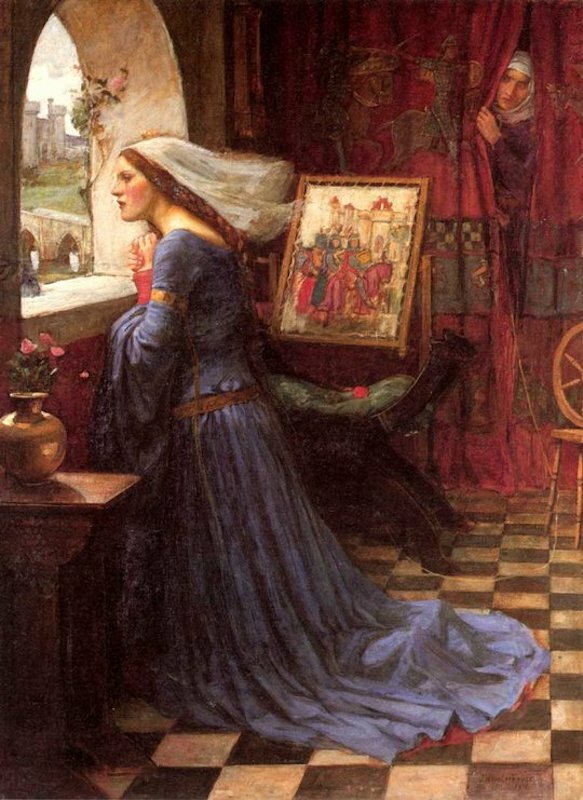 Waterhouse's Fair Rosamund was a real historical figure; she was the mistress of King Henry II. Like other Pre-Raphaelite figures, hers was a tragic love in that Henry II was already married to Eleanor of Aquitaine. However, the historical Rosamund apparently did enjoy a lasting relationship with Henry II [Wikipedia] and so represents a divergence from Pre-Raphaelite type. As Clyde Furst pointed out more than a century ago, Tennyson's rendition of Rosamund ends in tragedy, Henry has forsaken her, and although she remains loyal to her royal love, Rosamund chooses death over dishonor. In painting Fair Rosamund, Waterhouse was obviously much influenced by the Pre-Raphaelites. Indeed, Fair Rosamund , in both subject matter and composition, recalls Millais's Mariana; both depict waiting loyal women and are based upon Tennyson's poems. Mariana and Rosamund wait at a window, doomed to loneliness by their love. Both are noblewomen and dressed in a Medieval-eque costume. Both women are idle, their faces are serene and their bodies relaxed. Mariana and Rosamund inhabit a richly colored and textured indoors that contrasts with the green nature outside. Yet Rosamund peers out of her open window whereas Mariana stretches voluptuously before stained glass, Mariana is much more self-involved, she gazes inward, whereas Rosamund engages with the outside world, a breeze blows her veil off of her face. Rosamund remains hopeful that her love will return, her embroidery depicts knights riding by a castle, one assumes they are returning to her. In the end, despite the similarities between Mariana and Rosamund, the two women are fundamentally different, Rosamund retains a freshness and hopefulness that Millais's Mariana, tired and voluptuous, has lost. Waterhouse's Rosamund kneels in an enclosed space, one presumes her room. Her waiting figure is reminiscent of other Pre-Raphaelite type women. How does Waterhouse present the theme of Pre-Raphaelite elegiac love here? Men appear in the painting only in Rosamund's embroidery, the knights riding home, and in the drapes at the back of the room, a pattern of knights in battle appear on the red cloth. Why the contrast? Rosamund obviously inhabits a man's world, yet why do the men appear only as images within the painting. Would Waterhouse have any ostensible purpose in these depictions? I was surprised to discover that Waterhouse painted Fair Rosamund in 1917, at the height of World War One. Would this shed any light upon the subject matter, or perhaps on the juxtaposition of peaceful and embattled soldiers and the waiting woman at the window? Rosamund is not alone: the figure of the maid peeks around the edge of the embroidered curtain, a look of shock or disapproval upon her face. In other Pre-Raphaelite paintings, the use of the cloth in the background serves to push the figures into the foreground and closes the space. The red drapes ostensibly serve this same function; however, the maid's face amidst the folds reminds the viewer that there is space behind the curtain. Why does Waterhouse include the maid? "Rosamund Clifford." Wikipedia: The Free Encyclopedia. Viewed 20 November 2006. Furst, Clyde. "Tennyson's 'Fair Rosamund' in Becket" Modern Language Notes 16 (April 1901): 105-112. JSTOR. Accessed through Brown University. Viewed 20 November 2006.